What gives you the right? We are familiar with rights claiming, it comes easily to our lips when we believe we are entitled to something—to respect, to our fair share. Rights are fighting words. We invoke them when we have been wronged, when a situation has become intolerable. Rights claims are a way of fighting for control. What do we have a right to? In a sense, this is a question over what we should have control over. Conventional human rights to life, freedom from torture and arbitrary arrest reflect our sense that we should have control over our bodies, for example. So, what should we have control over other than ourselves? This is actually the central question of nearly all rights controversies. Here I do not want to offer a general answer to this question, as it is my considered view that there are no final answers to this question, only an always ongoing contest over our rights. Instead, I want to think about a specific right. Do we have a human right to the city? The locution is strange, I know. Yet, to claim we have a right to the city is to challenge the basic political and economic structure of contemporary urban life. The right to the city is a slogan used by urban political movements across the globe, which demands that each of us should have control over the cities in which we live. What could ground such a right? Rights, it seems, must be justified by something of significance and with wide acceptance. Philosophers have argued for generations about what that something is: dignity, autonomy, wellbeing, or our membership in a privileged community. This logic of justification makes rights claiming into a question of who we are, and especially what is valuable in us, ontologically speaking, that could justify us having control—of our bodies, over decisions that effect us, or even the cities in which we live. The right to the city, however, is something of a deviant rights claim. It is not made in the name of our membership in particular nation-states or ethnic groups. It is not based on an account of each of us as rational and autonomous individuals. It is not even rooted in our common capacity for suffering. The right to the city finds its justification in our experience of the contemporary city, and particularly the experience of the marginalised and oppressed. To understand the right to the city requires confronting the myriad injustices of the contemporary city, as it robs people of control over the most basic aspects of their lives. 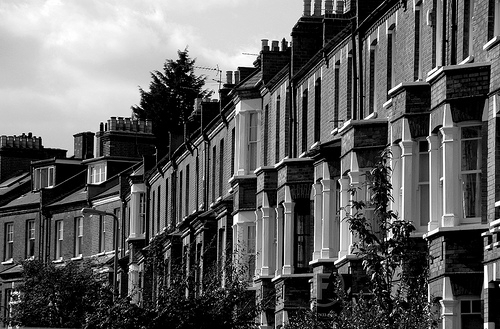 In the United Kingdom homelessness is reaching levels not seen since the Victorian-era. While in the United States, rents have risen to the point that there is no state in which low-income workers can afford to live without spending an excessive portion of their income on rent. London Terraced Houses by Kathleen Tyler Conklin. CC-BY-2.0 via Flickr. In London young mothers are forced to move hundreds of miles from their homes while their local council sells off social housing. In Rochester, New York, a heavily armed police unit forces an elderly woman out of her home in the middle of the night because of the fraudulent actions of her bank. In Athens migrants and asylum seekers are subjected to abuse from police and fascist political groups. In Washington DC young black men are stopped by undercover police officers and searched without cause—in nearby Baltimore, Freddie Gray was killed by police officers, an all too common tragedy. In Durban, shack dwellers are displaced to make way for new development projects, moved to unsustainable land and into inadequate housing, and then they are targeted when they fight for their rights. This brief summary of contemporary injustices points towards a global process of urbanisation that is profoundly anti-democratic and results in extreme inequality, which is maintained through state-sanction violence and the exploitation of vulnerable people, as well as the natural environment. What we can see is that even as more and more of us live in cities; we have almost no control over the processes that affect us so profoundly. The right to the city, then, is not justified by some obscure and contested truth about human nature, but rather by lived-in conditions of injustice. The right to the city is a claim for a more radically democratic urban politics, in which the denizens of a city are empowered to make decisions about common resources, control, and limit police and security forces, distribute land and housing more equitably, and build cities that are dedicated to supporting communities rather than generating profits. The right to the city is a challenge to the existing distribution of power—it is a demand for greater control. This then takes us back to my general reflection on rights: rights are a means of challenging and reconstructing the structures of social power, or redefining who has control of what in society. We will never discover a final or authoritative list of human rights, nor will we ever reach a lasting and complete consensus, despite the fervent efforts of many profound thinkers. Rather, human rights will always be contested, and in fact, will always be a tool of contestation. And this is at it should be, because at their best, rights have a profound democratic potential to increase the power each of us has over our lives and to ensure greater equality by insisting that each of us counts in our collective life —which is a job never done. Headline image credit: London, United Kingdom by NASA Goddard Space Flight Center. CC-BY-2.0 via Flickr. Joe Hoover is a Lecturer in International Politics at City University London, where he teaches on human rights, global ethics, and political theory. 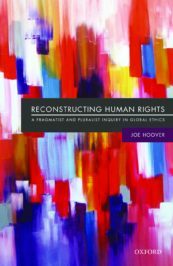 He is the author of Reconstructing Human Rights (OUP 2016). You can follow him on Twitter. I read to the end of the post merely to understand what it was about. I’m still not sure.